View Rooftop Bar is this rather exclusive bar located on the rooftop of GTower and like it's name, it has a wonderful view of the whole area. The last time I was here was for their bloggers night where we were served with a never ending supply of cocktails and vodkas. (View Rooftop Bar At GTower Hotel) This time around, I was invited over to hand me my own personalized View Rooftop Bar Members Card. So there I was at around 8pm to be greeted by the manager in charge and some food for the stomach. It was a simple event held solely to pass the cards off to their new members. This was the first time View Rooftop Bar is handing out their members card so I guess I must thank my lucky stars to be one of the lucky few to get this. Do check out some of the photos I managed to capture that night. 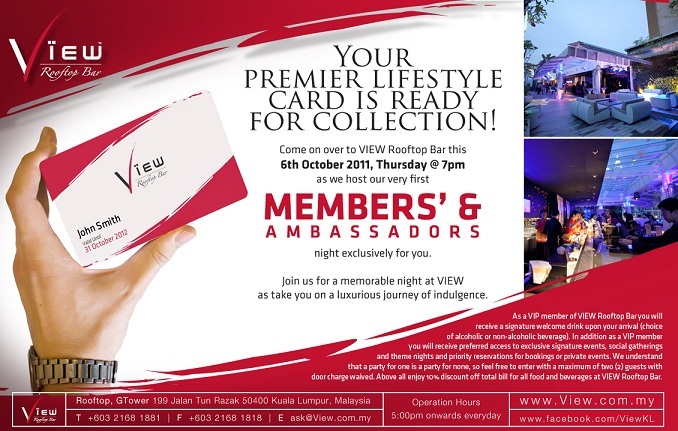 Anyway, since we're still on the topic of View Rooftop Bar Members Card, I list below the card's privileges. Be welcomed by View Rooftop's signature drink of the evening upon arrival, choice of alcoholic or non. Gain preferred access to exclusive 'Invitation Only' signature events, social gatherings and themed nights. 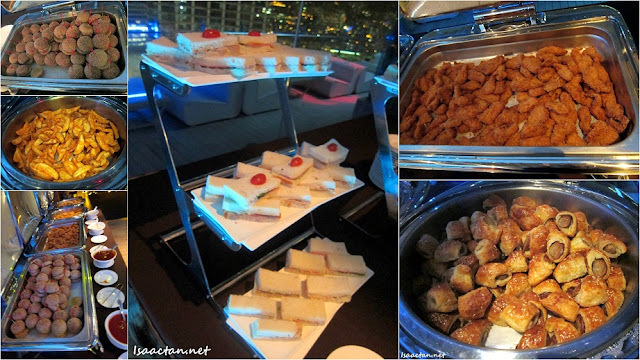 Access priority reservations list for bookings or private events. 10% off total bill for food and beverages. Waived door charge for card holder and 2 companions. For someone like me, a non-heavy drinker, I'm not sure if I will fully utilize this card, but it should come in handy should there be a special occasion or when one needs a place to chill out with friends. So if anybody wants to enjoy a night out with waived door charge and a small 10% off the bill, just ring me up. I might just take the Coke though. How have you been? Wow, this is the first time I've heard of an event held just especially to give the cardmembers their card. Well, at least something exclusive, right? Makes you feel special too..
Not much of a drinker are you? Well, you could be the designated driver, then. Hahaha I'm not much into the bar scene .. but this is definitely a great card to go yum cha once in a while with friends. And they have birthday perks too, which is awesome! Anyways, I hope you and wifey have been well after your trip! :) Take care! How come you are always a VIP?? always got free food one! I would love to dine here someday. The view is stunning! Guess the coke would have cost more than the cocktail haha. Nice one.. complimentary drink once arrive..
cool! Did you pay for the card? No, thanks. I'm scared of heights... Did not use to when young, growing old - more and more useless... Sobssss!!!! Lol, i'm not sure what the birthday Perk is yet though bro. Coz I'm an important person? lol perasan Isaac. This member card was won through their contest previously. somehow you are right, coca cola is rather expensive at joints such as these. Thanks for dropping a comment bro, and yea, nice complimentary drink.